Woodworkers Safety Week isn't for another few weeks, but it's never too early to talk about shop mishaps. You know how it is when you buy a new tool—you want to try it out right away. 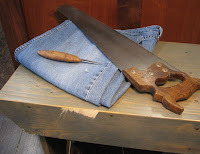 Such was the case with the antique handsaw I bought from Tom Law and the sloyd knife I bought from Del Stubbs. My jeans took the hit from the knife and saved my thigh from what surely would have been a cavernous gash in my leg requiring a freakishly huge number of stitches. And the poor little 5 board stool that I absconded from the house to use as a sawbench bravely endured the cold bite from the wickedly sharp crosscut saw. Friends, tragic events like this can be avoided. Before you use your new tool, inhale 10 deep breaths, play an Air Supply CD, maybe take a candlelit bath with rose-scented bath salts and loofah. Do whatever is necessary to quell your I-just-bought-a-new-tool-and-have-to-try-it-out-NOW! hysteria.